Ernest Zlotolow, a very active member of our club's International Committee, shared this photo of his son, Dr. Dan Zlotolow, and himself ( 7th and 8th from left) , along with some of the doctors at the Main Orthopedic Cuban Teaching and Research Hospital Frank Pais in La Habana, Cuba. Ernest and U.S. doctors are working on providing training to doctors in Cuba. Dr. Dan was one of the first two U.S. surgeons to volunteer to provide training. 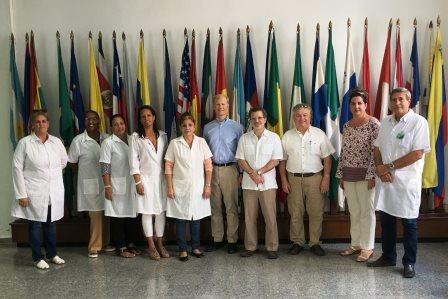 At the recent organizational meeting with the Cuban Ministry of Health, the hard work paid off, and they made amazing progress in La Habana, said Ernest. "Cuban hospitals are not lagging too far behind U.S. hospitals in theoretical knowledge, but technological resources are very scarce," according to Ernest. When they arrived, they were treated like royalty by four hospitals, with photos, shaking hands lines, and introductions to chiefs of staff and surgeons. The result of their meetings is that "we reached preliminary commitments with the top three hospitals, and the Minister of Health is enthusiastic and committed," said Ernest. Dates for two missions have been set. Mission two will take place March 26-29, 2019. One hundred Cuban surgeons are expected to attend! Mission three is set for October , 2019. "The paperwork for both has begun, but logistics have yet to be worked out," reports Ernest. What a great undertaking, Ernest! We look forward to hearing more going forward.